What a great night of Trick or Treating! You and your friends have gathered a GIANT HAUL of candy and now make ready to eat yourself sick. Not so fast, say your parents. This year is going to be different. All the candy is going to be divided equally. To be fair, everyone will be assigned a secret basket and all the candy will be distributed one piece at a time. Little do your parents realize that you know how to cheat the system. All is fair in love, war, and candy! 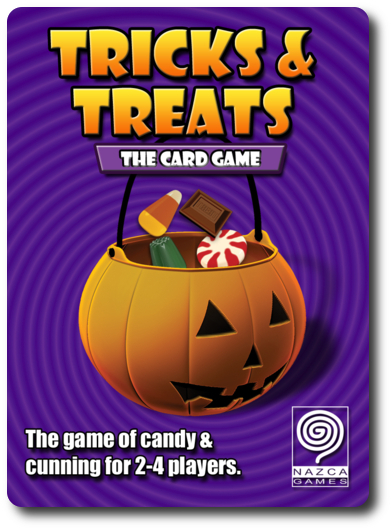 Tricks & Treats, designed by Emerson Matsuuchi and published by Nazca Games, is comprised of 48 Candy cards (that depict various cavity inducing goodies), 11 Special Basket cards, 6 Basket cards, 6 Secret Number cards, and 1 “Time’s Up” card, for a total of 72 cards. 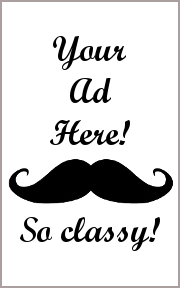 All the cards are made of thick card stock and durable. To set up the game, first separate the cards into their different types (Candy, Baskets, Special Baskets, Secret Numbers, and “Time’s Up” cards). Second, shuffle the Candy cards to create the Candy deck. Take the top 5 cards from the Candy deck, insert the “Time’s Up” card into these 5 cards, shuffle the six cards, and then place them at the bottom of the Candy deck. Third, deal to each player 2 cards from the top of the Candy deck. The Candy deck is placed in the middle of the playing area, face-down, and within reach of all the other players. Fourth, collect a Basket card for each player, starting with Basket card number 1. Now add two more Basket cards (these baskets don’t belong to any of the players and any candy put in them will be donated to the homeless shelter). For example, a 3 player game would have Basket cards 1, 2, and 3 for the players and Basket cards 4 and 5 for the homeless shelter. The rest of the Basket cards are set aside for the duration of the game. Place the Basket cards, face-up, in the middle of the playing area either in a line or surrounding the Candy deck in the middle of the playing area (whichever makes the most sense and is the most convenient for all the players). Fifth, take the Secret Number cards that have the same values as the Baskets visible on the table and shuffle them. Deal out to each player 1 Secret Number card, face-down. Players should not show this card to any other player! The number on the card indicates which Basket on the table belongs to them. Players keep their Secret Number card in front of them, face-down. The remaining 2 Secret number cards are also left face-down, but are set to one side of the game play area. Any Secret Number cards not used are discarded for the duration of the game. That’s it for game set up. Let’s divide up the candy! The game is played in turns with no set number of rounds. A player’s turn is summarized here. During the first step, the player draws one Candy card from the Candy deck. This card is taken in hand and added to their other cards.The type of candy is irrelevant. It’s how many pieces (noted by the number on the Candy cards) that really counts! During the second step, the player selects 1 of the 3 Candy cards they have in hand and deposits it under one of the Baskets on the table, face-up. Here is where things get particularly tricky because the players know three things. First, they know which of the Baskets is theirs. Second, they know that 2 of the Baskets are going to the homeless shelter. Third, all the other Baskets belong to their opponents. The goal is to now give up one of their pieces of candy so it’ll either benefit them, or if at all possible, benefit the homeless shelter (which not only has the positive outcome of giving to the needy, but also not giving candy to opponents). At anytime during a player’s turn, the player and any opponent can claim another player is cheating! Whoa, now! That’s a serious accusation! We’re talking candy here! How does a player cheat? Remember, the game is about “giving”, not “getting”. If any player thinks their opponent is filling their own Basket with goodies, that goes against the intent of the exercise (but is right in line with the spirit of the game). Calling someone a cheater has serious consequences and great benefits, both for the person who is possibly cheating and the accuser. When a player is accused of cheating, the player who is accusing points to them, calls them a “CHEATING NO GOOD CANDY THIEF” and calls out a Basket number. The number called is what the accuser believes their opponent has in front of them. If the number called was correct, the opponent being accused reveals their Secret Number card to all the players, passes it to the accuser (who keeps it face-up in front of them), and is now out for the duration of the game. If the number called was incorrect, the opponent being accused says “no” and secretly shows their Secret Number card to their accuser as proof. The accuser now gives up their Secret Number card to the opponent who was wrongfully accused (who keeps it face-up in front of them), and is now out for the duration of the game. Individuals eliminated this way should not share with any other player the number they saw on the card! This ends the player’s turn (or if unlucky, the game). Game play continues in turn order sequence starting with step 1 noted above. The game can end one of two ways. The first is that all but one player is eliminated from the game due to being correctly accused or wrongfully accusing others. The second is when the “Time’s Up” card is drawn (which will be one of the last six cards in the deck) and all the remaining players reveal their Secret Number cards. When the game ends, no more cheating accusations may occur (it’s too late at this point). The player with the most points wins! Any players who have the same number of points (a tie) are considered “cheaters” by their parents and lose all their points! In the case of their only being one player remaining, that player is the winner by default, obviously. Included with this game are 11 Special Basket cards. These Baskets introduce new rules that are used during the start of the game, during the game, and at the end of the game. 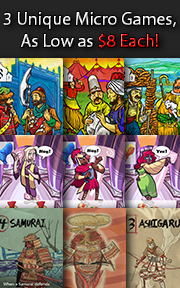 To use the Special Basket cards, the first player selects 1 or 2 Special Basket cards and adds them to the Basket cards noted in the fourth step of game set up. At the end of the game, and before players reveal their Secret Number cards, the Special Basket rules are resolved from left to right. Only after all the Special Basket cards have been resolved do the players reveal their Special Number cards and points are counted as normal. Piggy Basket: this special basket starts with 3 Candy cards, and at the end of the game, all the Candy cards in this Special Basket are added to the numbered Basket with the least amount of candy. Bad Candy Basket: the most numerous type of candy type in this Special Basket at the end of the game is considered “Bad Candy” and counts as zero points for all the players when counting points. Bomb Basket: whenever a piece of candy is added to this Special Basket, the player who added the Candy card swaps it with any Basket to its left or right (be sure to shift the candy, too!). At the end of the game, this Special Basket will explode destroying itself and the two Baskets to its left and right! Of course, any candy the Baskets contain are also destroyed. OH, THE HUMANITY! To learn more about Tricks & Treats, visit the game’s web site. What we have here is a stripped down press-your-luck and cleverly presented hidden role card game. The trick, if you’ll excuse the pun, to Tricks & Treats is to determine who each Basket belongs to before your opponents do the same to you. That’s a pretty fun exercise at it requires logical and critical thinking and then some deceptive strategy and tactics to keep your opponent’s off your trail. All the while, every point you give to another Basket is a point you are awarding (knowingly) to another player or the homeless shelter. Tricks & Treats shouldn’t be too difficult to teach to any of our groups, including the younger Child Geeks. I have no doubt that my 5-year-old can play this game, but will have a slightly steeper learning curve than his 8-year-old brother. Reading is not necessary as the Special Baskets can be read out loud and the numbers on the cards are small in value, making math simple. The most difficult aspect of this game is the level of observation it demands from the players.. If your opponents are not paying attention and messing up, victory is assured. I doubt any of our game groups are that sloppy, however. When it came time to teach my little geeks the game, I asked them one question first. “What is the difference between long-term and short-term goals?” Both of my little geeks understood the difference and I used that to help teach the game. I told them that the short-term goal was to slowly award yourself points while staying under the opponents’ radar. The long-term goal was to win the game by making sure you had the most points and caught the opponents’ cheating. This really got them excited and all I had to do was quickly demonstrate a simple round of play and they were ready to go. The only questions they had was wanting to know if it was OK to put candy under Baskets you knew belonged to a specific player. I told them it certainly was because that would give them a great advantage to play lower cards and then call out the Basket owner for big points later in the game. Both little geeks giggled evilly. As my 5-year-old and 8-year-old both picked out a Special Basket card to use in the game, I asked them their thoughts on Tricks & Treats so far. They were slow to respond as they were looking through the cards and asking me how they were used. My 5-year-old brings up a good point. As parents, we spend a great deal of our time reinforcing the importance of good sportsmanship, fair play, and respecting others which means you don’t lie, cheat, hit, steal, or trick others. And yet, board, dice, and card games require players to do these things (well, not so much the hitting). There is a time and a place for everything, however, and understanding the difference between when something is acceptable or not is something adults deal with, too. But that is a lesson for another time. Let’s play Tricks & Treats and see if we find it to be sweet or bitter. The Child Geeks really enjoyed Tricks & Treats and wanted to play it again right after the first game was over…and then a third time…and then a fourth time. We had to finally call it quits because there were other games to play. All of th Child Geeks we played the game with did an outstanding job with various levels of success. The younger Child Geeks understood they were supposed to distribute the candy as best they could, but not to a point where they were giving too much candy to their opponents. Such was their fear of being called a cheater, however, they seldom gave their own Baskets any candy whatsoever! This resulted in the least paranoid player usually wining the games. The older Child Geeks played a much smarter and dangerous game where they were clearly favoring two or more Baskets, but never made it obvious which one was theirs. Simply excellent and only when the Child Geeks messed up and focused a bit too much attention on a specific Basket were they ever caught. The Special Baskets were greatly enjoyed by the older Child Geeks, but the younger Child Geeks didn’t want anything to do with them. Regardless of Basket preference, all the Child Geeks voted to approve of the game. The Parent Geeks also had a wonderful time with Tricks & Treats, marveling at how difficult it was to try to determine who owned what Basket. This is because all the Parent Geeks “got the game” right off the bat. They started to give cards to other Baskets in hopes of baiting each other into calling cheats. The entire ploy was to get players out of the game versus collecting more points, however. This is the part of the game the Parent Geeks, including the non-gamers, really enjoyed. The bit of detective work, the close table watching, and the subtle plays kept everyone engaged and watching very, very closely. The only negative the Parent Geeks had to say about the game is that a noisy room is not a great environment to play the game in, as kids running around, fighting, and screaming tends to make a Parent Geek lose focus. Even so, all the Parent Geeks voted to approve of the game, found it to be casual, fun, challenging, and best of all, a game that could be played with the whole family – child, parent, and non-gamer alike. The Gamer Geeks didn’t care for Tricks & Treats until the Special Basket cards were thrown in. It was only then that they thought the game was worth playing, in their opinion. The Gamer Geeks also used a lot more table talk than the other two groups, talking smack, and daring others to call them cheats. This is the kind of game play one would expect from gamer elitists, and they took Tricks & Treats to a whole new level of complexity and entertainment. Was my opponent telling me the truth and having laugh at my expense or were they trying to put one over on me? Did he know my number and was just waiting for the best time to call me out? My mind raced with all the possibilities (mostly negative) when my friends started talking a bit too much or a bit too little at the table. When the games were done, everyone agreed that Tricks & Treats was, at best, a light filler but one worth playing with the Special Baskets. The game was approved by the Gamer Geek elitists who always enjoy a good hidden role card game where table talk is encouraged. Their only concern was the game’s theme, which makes it feel a bit out of place when playing it anytime of the year other than October. An excellent game. An elegant game. A downright nasty game. Tricks & Treats is all these things. It’s deceptively simple until you sit down with opponents who are like hungry sharks. Every players’ move is watched and the mood can be very tense. Behind every smile is a forked tongue with fangs just waiting for an opportunity to bring you down. You wouldn’t know it by the description that this is actually a family game, and a friendly one at that. It’s just that the game play, once the players get really involved, takes a turn from “friendly” to “fiendish”. I really enjoyed my time playing this game and wouldn’t hesitate to suggest it to families for an evening of fun or to Gamer Geeks as a lighter exercise between heavier games that still takes focus to win. Tricks & Treats plays well and makes you think. If you don’t pay attention and play smart, you’ll lose your candy and the game. I think the game is unimpressive for adults without the Special Baskets, however, so do play with those as often as possible. They bring a whole new level of contemplation to the game without making the game more complicated as a result. Do get Tricks & Treats on your family gaming table the next time you are looking for a sweet game with a bite, be it Halloween, Christmas, or whenever fun is required. 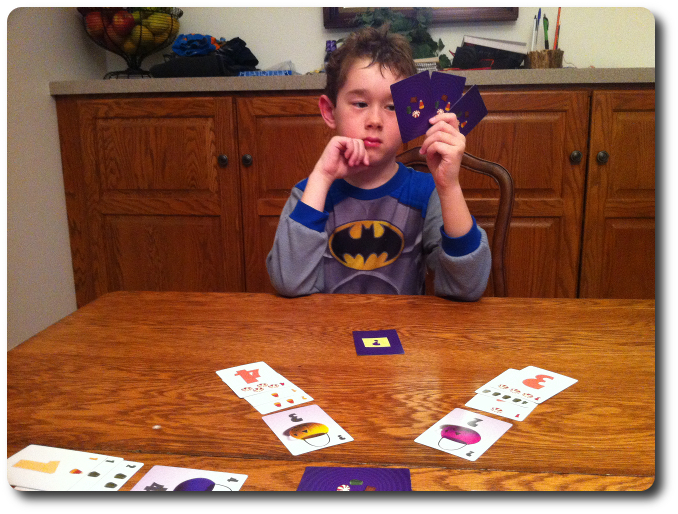 Tagged Card Games, Child Geek Approved, Father Geek Approved, Gamer Geek Approved, Parent Geek Approved. Bookmark the permalink.